UFC is returning to business tomorrow night (Sun., Feb. 17, 2019) with its first event on ESPN’s main network channel (UFC Phoenix). 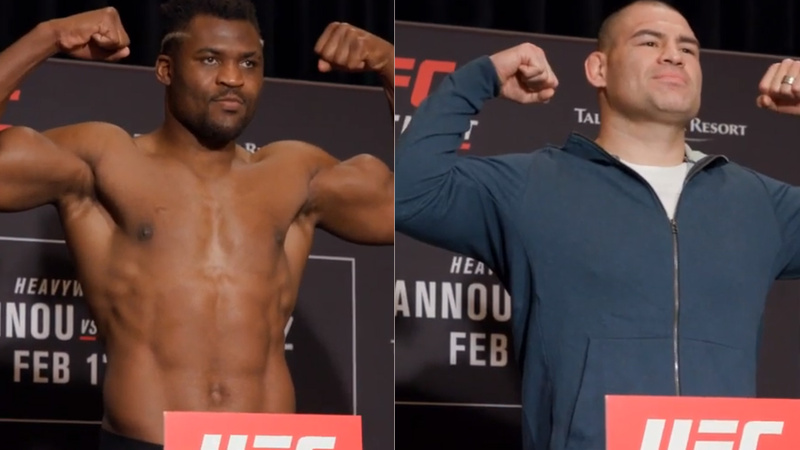 The main headliner features a heavyweight bout between former heavyweight champion, Cain Velasquez and knockout artist ex-title contender, Francis Ngannou. The main card also features some fun fights including a co-main event between lightweight contenders Paul Felder and James Vick, as well Kron Gracie is making his debut against Alex Caceres. The promotion held the weigh-ins for UFC on ESPN 1 fight card earlier today where all the fighters took to scale to make weight for their tomorrow night’s (Sun., Feb. 17, 2019) fight. Unfortunately, three fighters missed weight, Renan Barao, the former UFC bantamweight champion, tipped the scale (138) for his fight against Luke Sanders. The ex Invicta FC atomweight champion Jessica Penne weighs in (118) pounds for her strawweight fight against Jodie Esquibel. Both fighters will forfeit 20 percent of their fight purse. Manny Bermudez missed the weight by five pounds came in at (140)* versus his fight against Benito Lopez who came in at (135.5) will be fined 30 percent of his purse. All three fighters are allowed to fight at tomorrow’s event.